The Buffalo Sabres showed significant signs of improvement during the 2015-16 season. Sabres’ GM Tim Murray continued to reshape the roster this summer. With new players in the fold, expectations for the club are higher heading into the 2016-17 season than they’ve been in quite some time. Just how high these expectations should climb will be an important question for Sabres fans this season. Will the Sabres need to qualify for the playoffs in order for 2016-17 to be considered a success? Buffalo finished last season with 81 points. This was 15 points behind the Philadelphia Flyers which was the final wild card team to qualify for the playoffs in the Eastern Conference. In comparison to the 2014-15 season, last season’s Sabres upgraded their overall point total by 27 points. However, there are still many areas that the team can improve upon in 2016-17. One area of struggle for Buffalo last season was the shootout. A better performance in the shootout this season could help the team make their dream of returning to the playoffs become closer to a reality. The NHL implemented the shootout at the start of the 2005-06 season. Since then, the Sabres generally have performed well in the shootout. Heading into last season, Buffalo won at least half of their shootout appearances during all but two seasons. In most other seasons, shootouts helped the Sabres in the standings but last season was a very different story. The Sabres left seven possible points in the standings on the table due to their poor performance in the shootout. The team tallied just two wins in nine shootout opportunities in 2015-16. This equates to a 0.222 shootout win percentage which ranked Buffalo dead last in the NHL according to SportingCharts.com. If the Sabres want to fulfill their quest to qualify for the playoffs then they’ll need to perform better in the shootout to earn as many points in the standings as possible. Buffalo had a very difficult time lighting the lamp during the shootout in 2015-16. The Sabres scored just four goals in the shootout last season and no player on the squad scored more than one goal. Jack Eichel, Matt Moulson, Tyler Ennis and Sam Reinhart each lit the lamp once in the shootout. The goals scored by Moulson and Reinhart were game deciding goals. All told, the well for Sabres shootout goals last season ran about as dry as the Buffalo region did this summer. However, the goal-scoring drought on the shootout was not due to a lack of opportunity. According to NHL.com, the Sabres had a total of 27 shootout shots so there were plenty of chances to light the lamp. Ryan O’Reilly was unable to convert on six opportunities while Eichel scored on one out of his six shootout shots. In terms of scoring percentage, Reinhart led the team last season by converting one out of two or 50-percent of his shootout chances. Buffalo desperately needs to improve their shootout performance and there is at least one big reason to believe this will happen in 2016-17. The shootout has its critics with some favoring the return of tie games. Others have proposed an entirely different scoring system for the NHL standings. Regardless of one’s opinion on the subject, the fact remains that a good amount of points can be earned in the shootout. Sabres forward Kyle Okposo has found success on the shootout during his career. 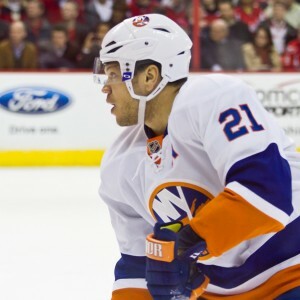 In the past three seasons with the New York Islanders, Okposo scored 12 goals on the shootout. Okposo was tied for the second-highest total in the NHL last season by scoring five shootout goals in 10 chances. In addition, eight of his shootout goals over the past three seasons were game deciding goals. Many analysts and fans view the Okposo signing in a positive light for Buffalo. Okposo has the potential to spark the Sabres’ offense joining a roster of talented forwards which includes O’Reilly, Eichel and Reinhart. However, others have pointed out that Okposo may experience a regression on offense due to the fact that he is no longer playing alongside star forward John Tavares. Regardless of Okposo’s offensive production next season, his success on the shootout during his career has not been dependent on other players. If the veteran can remain consistent in this area, relative to the past few seasons, then it is a very reasonable expectation that Buffalo will improve on the shootout in 2016-17. An improvement on the shootout would boost the Sabres’ overall point total and help move the club into the hunt for a playoff berth.